I'm used to Doctor Who tie-ins being rather light on interest for anyone over 12 who's actually seen episodes. This book is a much more in depth tome, full of bits that even scary hard-core fans (such as myself) hadn't picked up and details about how new Who fits with classic episodes. The publisher also has a very generous deal where they send you a DRM-free ebook in return for proof of purchase of the paperback! This book is MY companion through time and space!! I'm an old-school Who fan [Whovian, I guess, although I prefer Whomo], and I've been watching Doctor Who ever since the "Classic" series played on our local PBS station [Channel 11] every Sunday night at 11pm back in the 80's. I used to buy every Doctor Who guide or review book I could find, such as The Discontinuity Guide or Who's Next. This book is by far the best. I'm actually astonished at how good it is. Doctor Who is sometimes refereed to as a "children's show," but nothing about this text is childish: It is extremely smart, thoughtful, mature, detailed, and nuanced. It not sophomoric or slight in the least. Then again, it isn't a tome of academic articles either. It is a critically engaged but passionate examination of the stories in the "New" series. The "reviews" are excellent, because, first of all, there are always two of them, written by Graeme Burk and Robert Smith. What we get are two perspectives -- which always seem well considered -- unique to the hearts and thoughts of the two men. Both notice different things, enjoy different things, become irked by different things, etc. Sometimes they both enjoy an episode, sometimes they both problems with an episode, but they always make compelling arguments for their thoughts/ideas/opinions. Even if I disagree with something, I usually feel that they've made good points. But then again, they don't often seem wildly off the mark. But to simply call this a review book would be to underestimate all what it has to offer. It includes some production details, it briefly summarizes the stories, it includes "Roots and References," it tracks developing threads and motifs, it lists details about the Doctor's back-story/travels/history which are revealed in a particular episode, and it includes favorite moments ["Stand Up and Cheer"], least favorite moments ["Roll Your Eyes"], and discontinuity or logic errors ["You're Not Making Any Sense"]. The sheer volume of details explored in the book really facilitates my appreciation for the show. And then there are sections called "The Psychic Papers" which periodically appear in which various topics are discussed: such as the Doctor's changing relationship to the subject of "changing" history, retcons, the Timelords, the "wilderness" period between the Classic series and New series and the novels and audios which were produced during that period, etc. Basically, the way I used the book was I watched an episode and then read the text related to that episode. The guide goes up through season 6, and maybe, hopefully, it will be updated from time to time. That said, even as it is I consider it essential and I recommend it to ALL fans. It was the perfect companion through series. This book was my Sarah Jane Smith. A very fun, very engaging and entirely entertaining book looking at all the episodes of the revived Doctor Who; Graeme Burk and Robert Smith? are clearly Who fans of old, but - unlike so many fans of "classic Who" - that doesn't mean they hate the new series for being its own thing. This book is, in fact, part of a new (and, thankfully, refreshing) trend of Who discussions by classic fans who don't feel the need to trash the new and different television show, - and we could certainly use more of them!My only criticism, perhaps, is that the breezy style which makes it such a lightweight and easygoing read does prevent the reviews from ever really delving too deep. For instance, the stellar About Time series of classic Who episode guides is inspiring in large part for the level of nearly excessive, certainly exhaustive detail that each story merits, with a great amount of incisive analysis and insight unparalleled in any episode guide I've ever seen. (Rumor has it that a volume on new Who is forthcoming. Given its authors' blatant dislike of new Who, I both anticipate and dread the results.) And yet the word "exhaustive" was not chosen lightly; by the time you finish one of its chapters you can feel strained with the effort! Not so here, where the reviews always feel a joy and a celebration of the show in question - even, it must be said, when in the midst of a season which one of the authors finds a bit of a slog.In short, one of the better-written episode guides out there, and possibly the best guide on the subject of new Who. Entirely recommended! This is a very well thought out and introspective guide of the first six seasons of the new Doctor Who. This book has more interesting facts on the series than you know what to do with. One of the highlights in my opinion, is have the two authors both review each episode, which leads to differing viewpoints, instead of creating an "official" stance on each episode. The opinions are solely that, and it's ultimately left up to the reader to decide how they liked each episode. Had the absolute delight of meeting the two authors at Ottawa ComicCon 2013 and got them to sign my copy of this amazing book.I love going in depth and going over every small thing in the episodes, so this book was a must have. Great to read, great for random little bits of trivia!BUY THIS BOOK! Seriously! Okay, so it's not really "non-fiction", but it's a book about a show, not any new fictional content, so I'll call it NF for my own personal records. This book is great. If you're a fan of the new series, you'll want to pick this up. Each story, including mini-sodes, are discussed, through the Wedding of River Song (End of series 6). They explain what it's about, tell you one great moment and one not-so-great, explain who the Doctor is in that episode, how he interacts with the companion, and some interesting trivia about the episode. Then each author reviews it in their own way, sometimes agreeing with each other and sometimes not. They made me think about some episodes I dislike in a way I hadn't considered, and likewise on some episodes they provided a humbling balance to ones I considered flawless masterpieces. I disagreed with them on several points, but I think that's the beauty of an open-ended and thought-provoking show like Doctor Who: you can disagree with someone's opinion but still value it. What motivates, encourages, discourages, and annoys one person may be entirely different for another. For example, I can't stand Rose Tyler. I think she's weak, selfish, and makes the Doctor weak in return. But that's my opinion and I know there are a great many Rose fans out there who value her heart and loving nature. I don't particularly consider those strengths in a character, but that doesn't mean I begrudge you the right to think of her as an awesome character. Just like I don't want to be judged for thinking that Amy and Rory are possibly the best companions ever (except Donna), despite their nigh-sociopathic lack of emotion for their missing child. Because they are my husband and I in a nutshell (although my husband has a bit more spine than Rory does when he's non-Centurion). I think any Whovian would appreciate this book and it makes for some great discussions if you happen to live with another Whovian as I do. I don't normally enjoy either fan reviews or trivia on TV shows, so this is not normally a book I would enjoy. But I found myself reading 3/4 of it in one day, and thoroughly enjoying it. A reader like me who doesn't care too much about trivia or continuity commentary could easily skim the bits of the book that aren't the main reviews, but a reader who enjoys those things will find those parts thorough and interesting. The reviews are the real gem of the book, though. The back-and-forth between the authors, the humorous digs at each other, the smart and insightful commentary, and the real sense of friendship all make the reviews entertaining and quite lovely. Even when you disagree with one or both of them, they were still a joy to read.I appreciated the sustained attention to race throughout the book. This isn't something you see frequently in Doctor Who books with a mainstream fan audience. I nearly cheered at Robert's review of "The Shakespeare Code," an episode that has annoyed me since it aired. Bravo.What I found missing was much attention to gender. In fact, it felt like a big, gaping hole. How can you write not one, but two reviews of "A Christmas Carol" without mentioning women in refrigerators? How can you talk about River Song without at least exploring how she went from badass, independent woman to a character whose entire life, from birth to death, is dependent on the Doctor? There's more to talk about here than plot holes, boys!Overall, however, this book was fun, energizing, and entertaining. I highly recommend it to any smart and engaged Doctor Who fan. So if I'm completely honest, I technically didn't finish this one. I got about 30 pages from the end and had to return it to the library. I'm going to put myself back on the hold list and I'll finish it when I get it back. However, it was so close I'm happy to call it read.I kind of took a pause, because we got to the final season (season 6) of the new series and that's the one I'm most emotionally involved with. So while I recognise issues with the episodes, I kind of took a breather from the writers' opinions (which were generally positive and certainly reasonable) and suddenly found the book had to go back or I'd be paying fines.That's okay. I really enjoyed the book as far as I read it, and I'm sure I'll enjoy those last few pages as well. The trivia was fun, I liked that this was about the episodes and the writers' reactions to them rather than an episode guide with great details about what happened.And finally, I've got all the pieces together about why Elizabeth I was so ticked off with the Doctor. 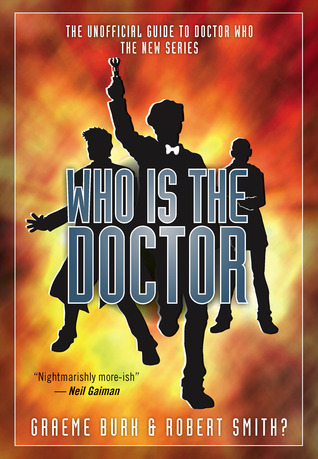 I'd never quite put it together before, leaving it a mystery.A fun book, especially for any new series Doctor Who fan. Recommended. Graeme Burk and Robert Smith? take the best elements from The Discontinuity Guide, the About Time series, and the Howe-Stammers-Walker programme guides and apply them to the New Series. The book is well written, thoroughly researched, and enlightening. I especially liked the "Adventures in Time and Space" sections, which show how various episodes both from the Classic and New series are referenced; there were several times I learned something new, and that's saying something for an old, cynical Who fan like me!If I had one minor quibble, it's that I thought the authors were too much in the same opinion for many of the reviews. Just a little more disagreement over stories would've been nice, if only to better point out the flaws and good points of all the episodes. But that is only a tiny little flaw, and I think this a great book for any fan of the show. This is a terrific book that fans of Doctor Who will really enjoy. Its focus is the new series which began in 2005. I have a lot of books that review Doctor Who episodes (the About Time series, Running Through Corridors, Doctor Who - The Television Companion, etc) and this is one of the very best I've read. The format is very similar to Mad Norwegian's About Time series...two writers offer up details and their opinions on each episode. There are also pieces giving background on aspects of the show that originally appeared in the previous incarnation of the series which is handy for those fans who only began watching in 2005 or more recently. For example, the book starts with a brief (but thorough enough) history of the original series and the previous Doctors. It's a fun read and a real page turner. Highly recommended! This book is an impressive tome of new series Dr. Who information for any die-hard Whovian. I won this book via First Reads, and I was absolutely stunned at the size and information content in the book. I was expecting a thin, image-laden, superficial information type of book, and what I received was beyond all of my expectations. The book is an episode-by-episode guide of the first six series. The guide features much more than a plain plot synopsis, but also include any outside references, connections to the old series, where it fits in the story arc, information about the Doctor and his companion(s), the "bad guy" as well as much more! They are entertaining to read, not dry in the slightest, and definitely make me want to go back and re-watch the episodes.Burk and Smith? have done an excellent job showcasing their love for Dr. Who. This book is a must for any new-series fan! Brilliant guide with enormous amount of trivia about the new Dr Who. It describes and has opinions about all the episodes from the first six seasons. I found out there are actually some episodes I haven't seen and am looking for these now. I would want to read the episode guide after seeing it first, rewatching after reading the guide, then watch one more time with the guide in hand. The following part I copied verbatim from another review: It applies exactly..So if I'm completely honest, I technically didn't finish this one. I got about 30 pages from the end and had to return it to the library. I'm going to put myself back on the hold list and I'll finish it when I get it back. However, it was so close I'm happy to call it read. As a relative newcomer to Dr. Who, this book explained a lot. I only watched a few episodes of the 10th Doctor and the current series so I was constantly asking someone to explain the background to me. I didn't read all of this but I skimmed through and definitely gleaned some understanding. It was also fun to go through the episodes I have seen and read the experts' take on them. Good to know that such a book exists for the next time I get confused! A true Whovian might have been bored, but it was perfect for me. I stayed up until 3:00 AM reading this book, and although I love books, I usually love sleep more. Usually. I highly recommend "Who Is the Doctor" to any "Doctor Who" fan (although it is filled with spoilers, it won't make any sense to those who haven't seen the episodes.) It contains detailed analysis and reviews of every episode of the New Series, along with plenty of information about the connections to Classic Who. I found it a compulsively enjoyable read. For Doctor Who fans: this is a must-read guide to the six seasons in the New Series (beginning in 20005). Fascinating information for each episode: synopsis with detailed analysis, cultural references & connections to Classic series, explanation of each season's story arc, character relationships, regenerations and so much more. It is presented in an accessible, fun-to-read format and will be enjoyed by both the novice and expert fans. I enjoyed this book immensely, it's always a pleasure to read what other Who fans have to say about the show! Especially fans who have access to resources and connections that I lack. That the two reviewers have such differing opinions about the stories only adds to the fun! I highly recommend this book to anyone who is a fan of Doctor Who, is just being introduced to the show, or is just wondering what all the fuss is about! One can never really be "Done" reading this book. It's almost the type of book you'll grab, open and just start reading.I've seen each Ep. of The New Series many many times and I still love reading about them. Even the ones that totally weren't my faces.Great touch having both authors weigh in on their likes and dislikes.I also like the historical context that the throw in about earlier Doctors, Companions, Monsters, etc.This book is Fantastic! Picking up where the Discontinuity Guide left off, Graeme Burk and Robert Smith? do an admirable job of unpacking the new series up to series six. Whereas the Discontinuity Guide gave us brief snippets of reviews, Burk and Smith? each spend upwards of a page or two with their own takes on each adventure. The good news is that both authors have insightful things to say. As a big fan of Dr Who, I really enjoyed this. Written by fans, it delves a little more into the interesting bits of the new series (since Christopher Eccleston), but references back to the original series. I need to see the Matt Smith episodes again now, to tie up some loose ends I didn't really get the first time round. Nice detailed review of the first six seasons of New Who with some interesting trivia. I didn't always agree with the authors' take on episodes, but I've gone back and watched some of them with a more open mind after reading about them. And it's good to know I'm not the only person who thought Amy was a shallow, rotten person most of the time. Best book ever. I've always been interested in Doctor Who. This episode guide is funny but, also gets the information to you. I've even discovered episodes of doctor who i never knew existed. My favorate episode in the guide is End of Time (Parts 1 and 2). These are my favorate entrys because the authors are funny and complain about things they dont like/ praise things they do like. I really liked this book as a great resource for new who. It doesn't include the last season or so, but in retrospect I'm wondering (and hoping against hope I'm wrong) if the revitalization of this TV series might be nearing an end. In any case, this book charts the years where Doctor Who was really giving sci-fi television a shot in the arm when it needed it most. Smartass survey of the reboot under Davies and Moffat, with commentary on the scripting process and production choices--I am very relieved to know that the flash of recognition I get of an in-joke or a reused prop or a reference to another 1970s BBC show is actually the product of vast wasted trivia knowledge and not a brain tumor. Also, still can't stand Rose. The authors dissected each episode of Doctor Who, and discussed how each episode fit into the over all story arc. Loved it. Going on my wish-list so I can purchase it and read it more in depth in the future. This was a great read if you have already seen the entire new series. References and plot points are explained. So if you feel like you may have missed something while watching the episodes, pick this book up. Graeme Burk Robert Smith - GRAEME BURK is the co-author (with Robert Smith?) of the guides to Doctor Who, Who Is The Doctor and the upcoming Who's 50 (both published by ECW Press). He was co-editor of two anthologies of fan writing on the Classic and New Series of Doctor Who, Time Unincorporated (Mad Norwegian Press, 2010 and 2011). A finalist for a new screenwriting prize with the Writers Guild of Canada, he currently has a screenplay in development. He has had his work published by magazines, websites and small presses throughout North America and was the author of three stories in the Doctor Who short fiction anthologies, Short Trips. He loves Toronto but lives in Ottawa.